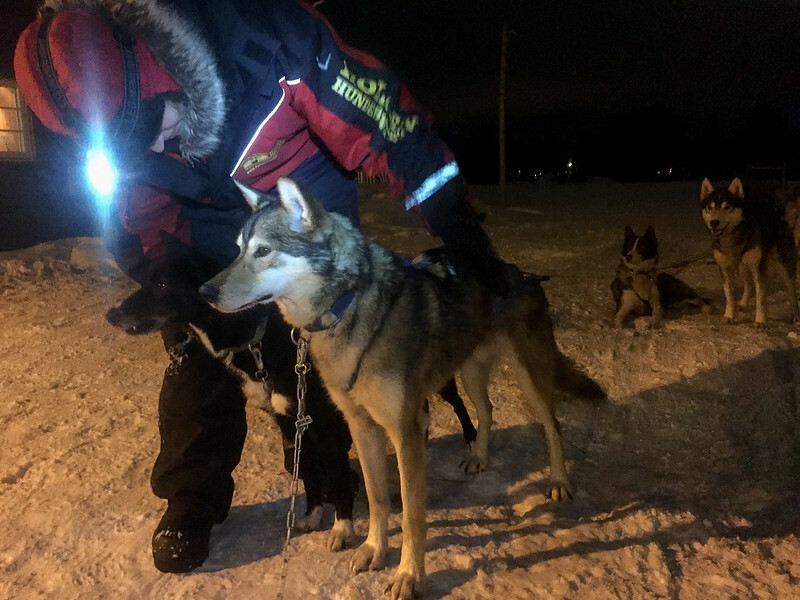 The sled was swishing across the moonlit snow, taking smooth turns between spindly trees as the team of five huskies in front of me trotted on silently, reaching down every few meters to lap up fresh snow with their long, pink tongues. The snow-lapping made me giggle. As did the fact that lead dog would look back and glare at me any time I made said giggling noise. For these dogs, this is serious work. No giggling allowed. I've been dogsledding before, but this was the first time I was “driving” a sled myself. (Though, let's be honest – the dogs were 100% in charge, and I was just along for the ride.) Also, unlike my first dogsledding experience in Canada, this ride was being done in the dark. Located just outside the small city of Alta, the Holmen Husky Lodge didn't start as a tourist endeavor. When owner Eirik Nilsen moved to Alta in 1987, it was to race. 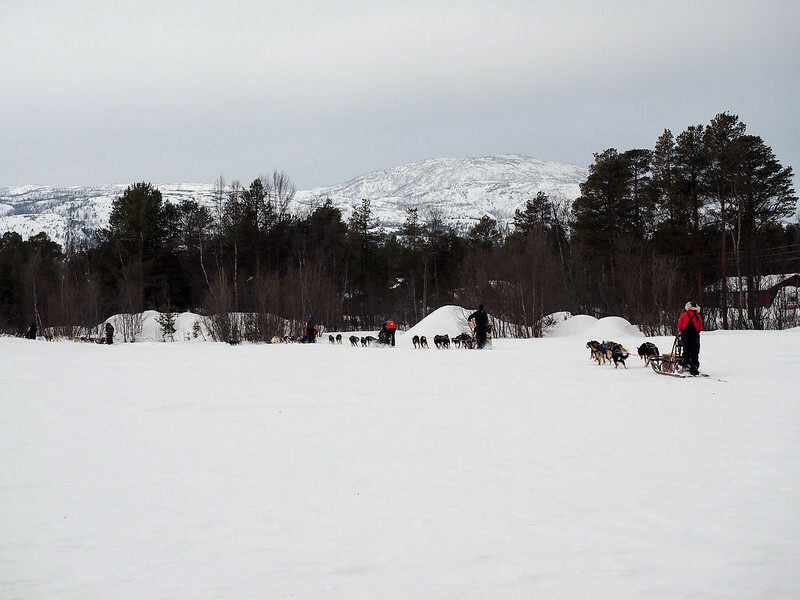 Alta is home to the Finnmarksløpet dogsled race, the longest race of its kind in Europe, and Eirik has run it more than a dozen times (and has three wins under his belt). In 1996, though, Eirik realized that visitors to Alta were interested in dogsledding, too – and so the Holmen Husky Lodge was born. 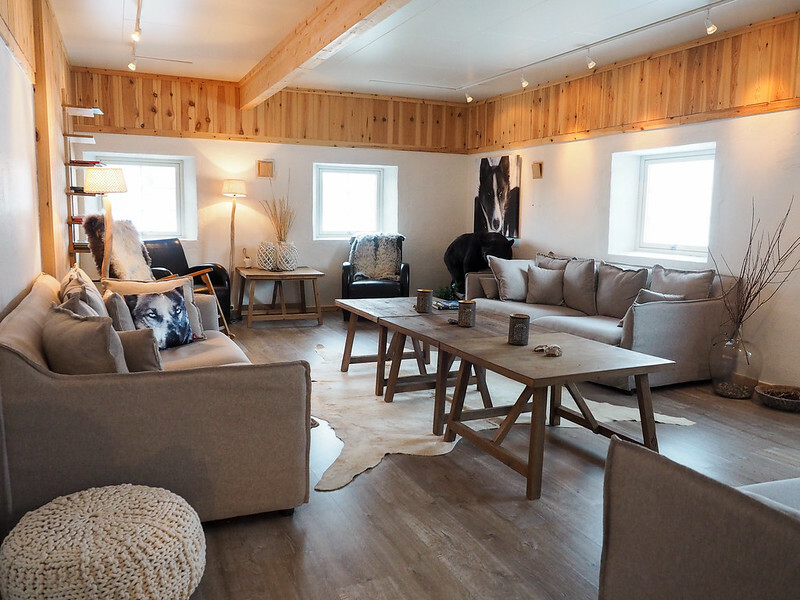 Today, people can visit year-round to drive sleds, cuddle puppies, and even stay overnight in luxurious lavvo tents – which is exactly what I was there for. 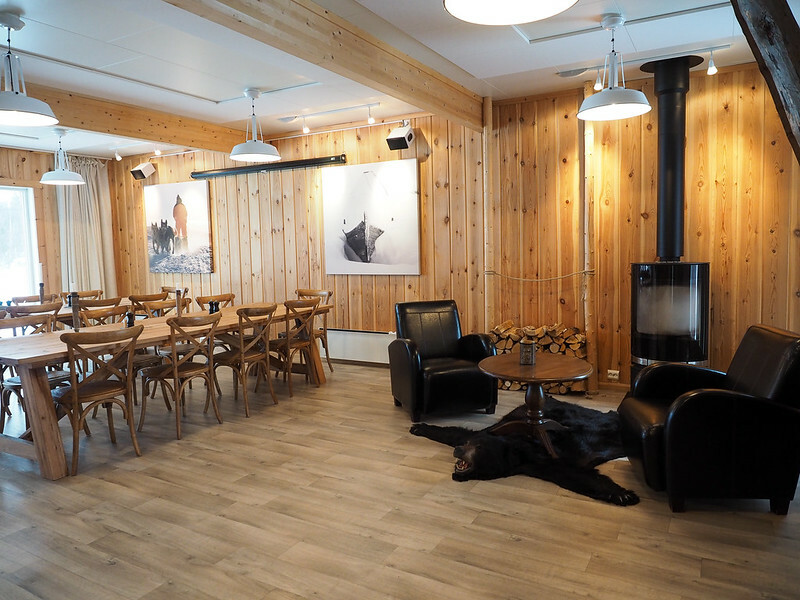 This experience with the Holmen Husky Lodge in Alta, Norway, is perhaps one of the most unique ones I had on my recent trip to Northern Norway. As soon as we arrived from Alta, we were immediately geared up in thick snowsuits and thermal boots in preparation for our 15-kilometer sled ride through the snowy forest. The light was failing fast as we were instructed how to “drive” the sled (long story short: hold on and don't fall off), and then before we knew it we were setting off into the twilight. It was a partly cloudy night, but the brief peeps of moonlight coupled with the headlamps we wore meant that we had no trouble making out the wintry landscape surrounding us as we rode. The ride was smooth and not too fast – I barely had to use the brake at all when it was my turn to drive – and was actually over far too quickly. We pulled back into the dog yard after dark, and were finally able to give our dog teams some well-deserved pats. If I'm being perfectly honest, I am 100 percent a cat person. I can appreciate cute dogs and their silly antics, but I'd rather hang out with and cuddle cats any day. So the prospect of staying overnight at a place with nearly 80 dogs wasn't exactly something I was giddy about. But I needn't have worried – while the dogs are a big part of the Holmen overnight experience, they aren't the ONLY part. Plus, I made at least one friend! After some cuddles and praise for the dogs, it was time to tour our overnight accommodation. 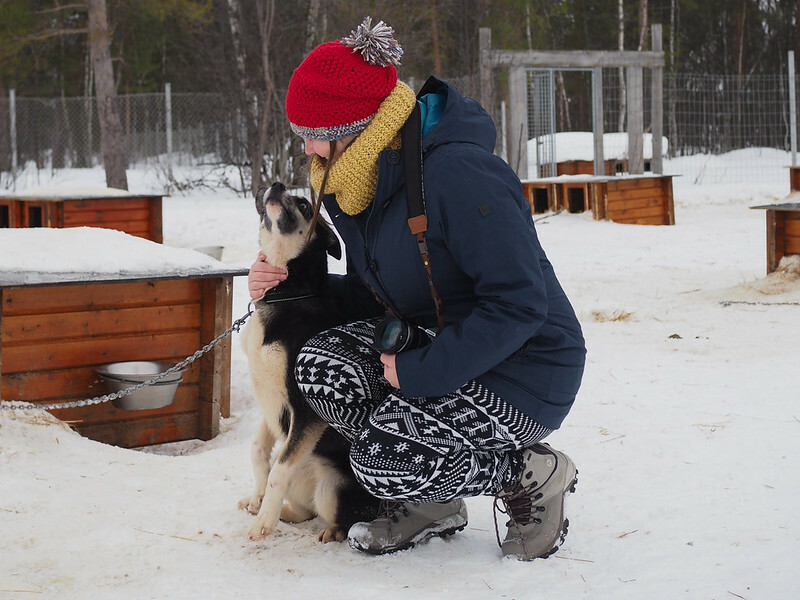 Most visitors to the Holmen Husky Lodge come during the day for a dogsledding experience, some doggie bonding time, and hot drinks before heading back to Alta. And a large portion of these visitors are from the cruise ships that call periodically in Alta's small port. 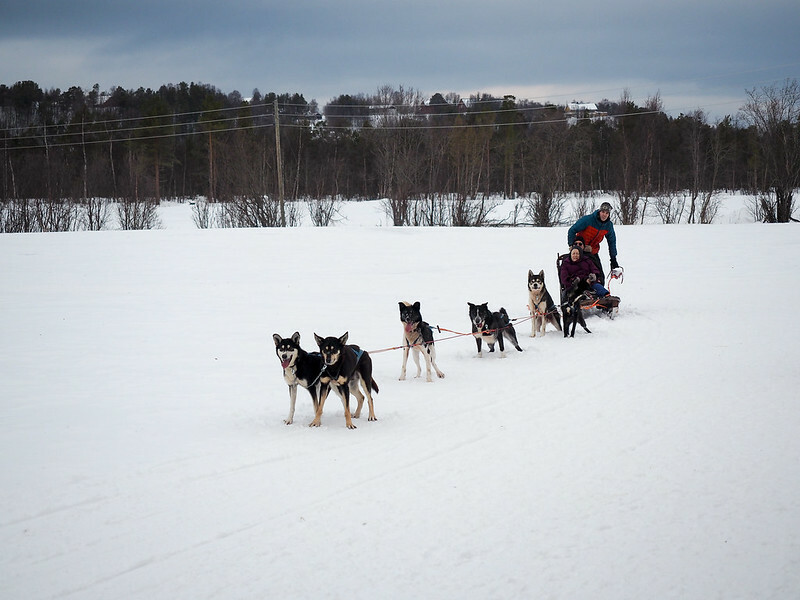 But Holmen also offers multi-day dogsled tours, as well as overnight stays. We got a tour of the “main house” first, which consists of a beautiful kitchen/dining area and a cozy living room. I fell in love immediately, and threatened that I might never leave. Next we saw the bath house, complete with piping hot showers, another lounge area with huge floor-to-ceiling windows, and a hot tub and sauna outside. And then finally we saw where we would be spending the night – in modernized lavvu tents. 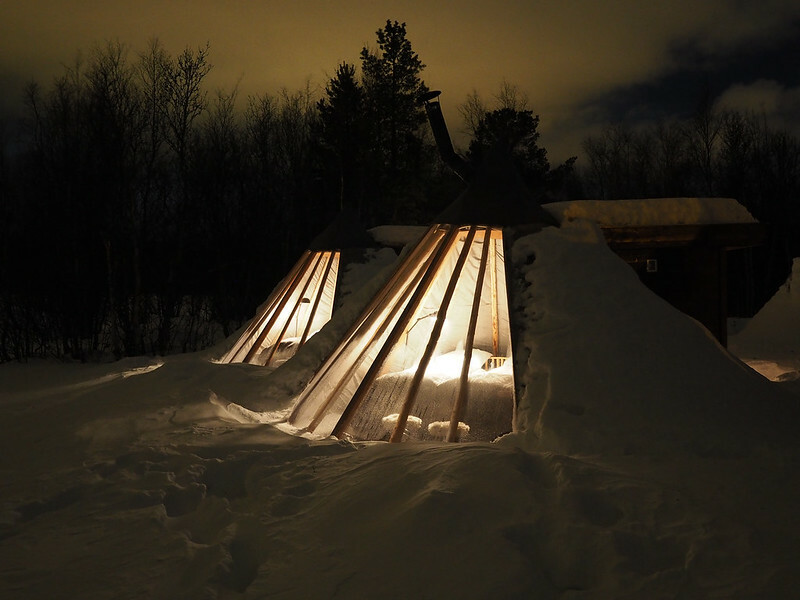 A lavvu is a traditional tent used by the indigenous Sami people of northern Norway. Traditionally, these are made by stretching reindeer hides over wooden poles and lighting a fire in the center for warmth/cooking. At Holmen, though, the lavvus are much more luxurious: they're made solidly from wood and glass, contain a full-sized bed (with one of the heavenly mattresses all Norwegians seem to own), and are heated by a small wood-burning stove. After dropping our things off (and, in my case, squealing a bit at how awesome the place is), we headed back into the main building for a delicious cod dinner and some chatting before dinner. The owner, Eirik, had a drink with Marie and I, and we chatted about everything from dogs to the U.S. healthcare system to how we all deal with answering a lot of emails every week. Eirik is your typical Norwegian – blunt and to the point, and yet clearly really passionate about what he does. Our evening was done after dinner, but as I was headed back to my lavvu, I happened to look up and see a break in the clouds overhead. And any break in the clouds above this part of northern Norway in winter means a chance for a sighting of the Northern Lights. And, sure enough, within a few minutes I spied the aurora peeping out from behind the fast-moving clouds. I ran inside to grab my camera and tripod, and messaged Marie to come outside as quickly as possible. And then, just as quickly as they'd come, the Northern Lights were gone again. That aurora – she can be so fickle sometimes! The fire had gone out in my lavvu by the time I went to bed, and I wasn't able to get it restarted. But thankfully the comfy bed comes equipped with electric blankets, so I was still able to sleep cozily until 79 barking sled dogs woke me up at breakfast time. A group of cruise ship passengers was visiting in the morning, which meant that we got to see first-hand the flurry of activity that's necessary to get 10+ dog sled teams ready to go as we sipped our coffee. The dogs were SO excited to be running again, and I felt sorry for the few that were left behind in the dog yard to watch forlornly as their canine peers bounded off to be harnessed up. How dare you not choose me. As Eirik reminded us, he doesn't breed dogs based on looks – he breeds them based on their enthusiasm to race. And the dogs at the Holmen Husky Lodge definitely have that enthusiasm. When it came time to say goodbye to the dogs and the lodge an hour or so later, I found myself actually reluctant to go. I may not be a dog person, but I can certainly recognize a unique and memorable experience when one is put in front of me. If you ever find yourself in Alta, I highly recommend an overnight stay at the Holmen Husky Lodge! 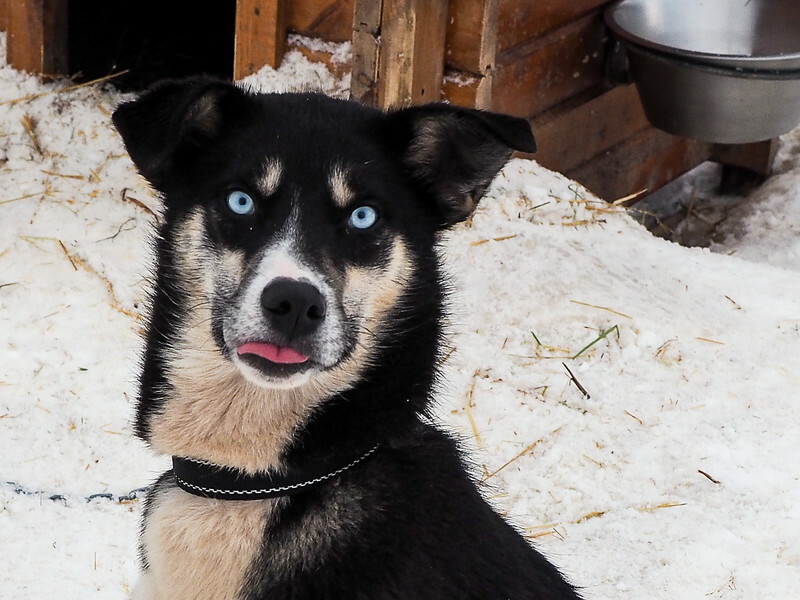 When: December 1 – April 30; pick-up is usually around 4 p.m., and you'll be back in Alta the next day between 10 and 11 a.m.
What's included: Transfer to/from Alta, a 15-kilometer dogsled ride, dinner and breakfast, and accommodation in a lavvu (price is for double occupancy). You are also free to visit the dogs, hang out in any of the common areas, and use the sauna and hot tub. 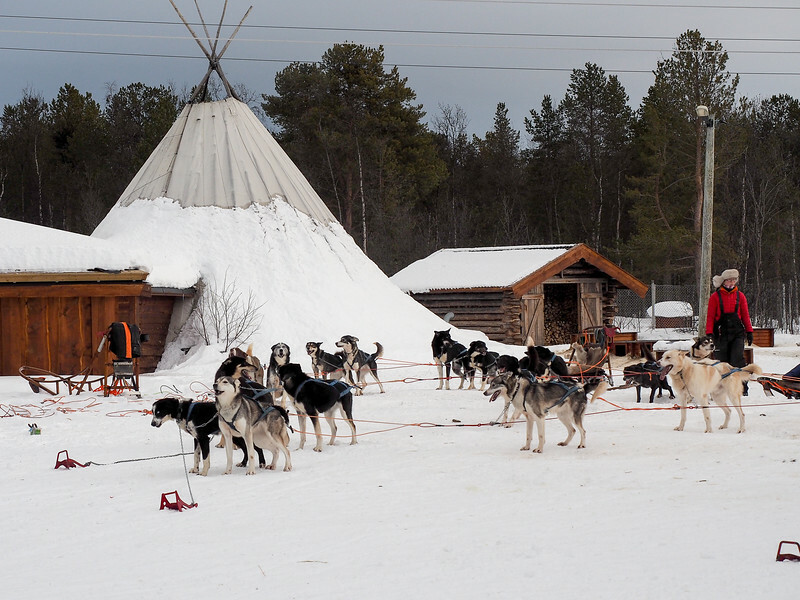 Read reviews of the Holmen Husky Lodge here! Note: Big thanks to Visit Northern Norway and the Holmen Husky Lodge for hosting me during my stay, and for the folks at North Adventure in Alta for coordinating it all. As always, all opinions are 100% my own. Definitely one of my top moments from the trip! Everything was perfect at the husky lodge – aside from my total lack of fire-starting skills! Haha, yes, my fire-starting skills were pretty abysmal, too. (Actually, it was more my “keeping a fire going once I started it” skills.) But it was still such a unique overnight stay, and the lodge was so gorgeous! Sounds so fun! I reeeeally want to have a sled dog experience, and I happen to be 100% a dog person 😉 Northern Norway just seems to be a really cool unique place. I actually started pondering going to graduate school in Tromso a few years ago (though that will be far in the future) so I’ve been interested in that region quite a while. Was this your first time up there, or just your first winter time? Northern Norway IS a cool and unique place! This was my first time that far north (though I’d been to southern Norway once before), and I really loved it! Tromso is a very cool city. Now this is my favourite report so far….this is the place for me…..glamping? Top notch? It was pretty great! The tents themselves were small and only had the essentials, but the rest of the lodge was so spacious, yet cozy at the same time. Plus, sled dogs! Aww… that picture with your dog friend is so adorable! And I would love to spend some nights in lavvo some day! 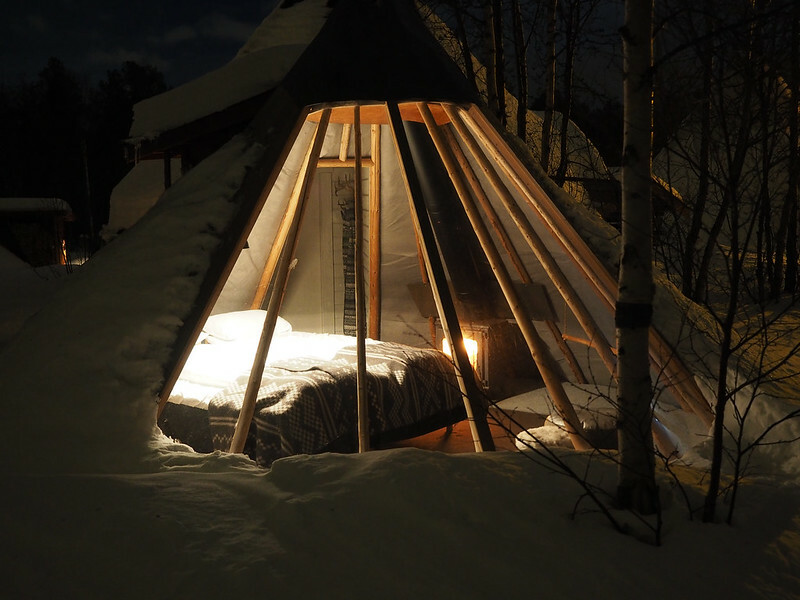 I’m not sure I’d want to sleep in a traditional lavvo (you know, with an actual fire smoking in the middle of it), but this was a great compromise! How fun! 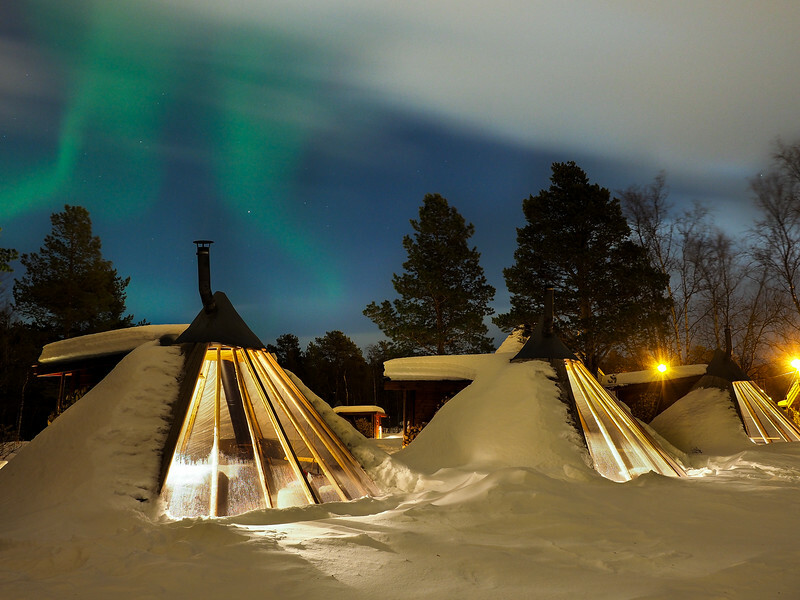 Spending a night in one of these modern tents with glass walls and watch the Northern Lights there is definitely on our list for a while! I’ve been dogsledding three different times now, and I have to say that the dogs really DO seem to love it. They lead different lives to pet dogs – they’re bred to RUN, not sit on laps. 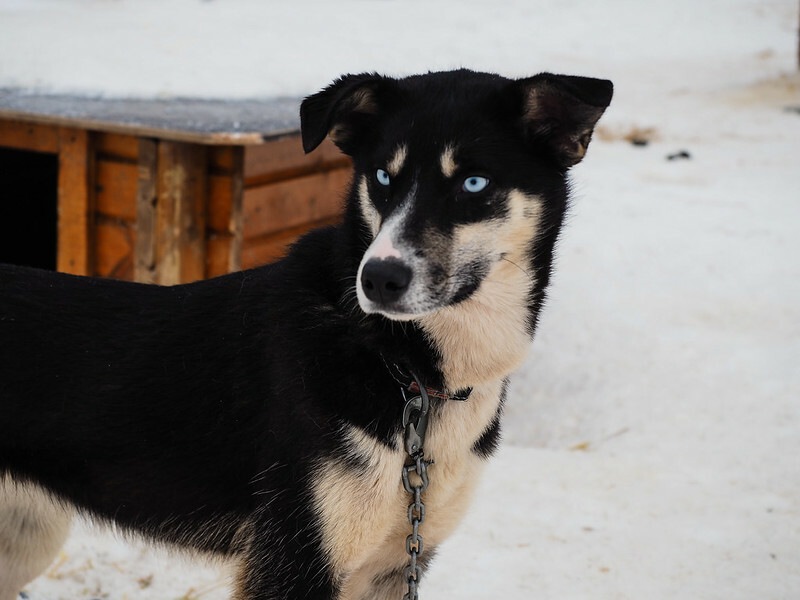 But they lead good lives – every sled dog I’ve met has been very well taken care of! Her eyes were so amazing!! Wow, what an amazing experience! I’ve never heard of something like this before — thanks for a wonderfully unique post and for all the photos, I felt like I was really there with you!! Thanks so much, Caroline! This was a first for me, too – I would highly recommend it! Yep, definitely adding this to my bucket list! It looks so fun and the huskies are so cute! It is certainly bucket list-worthy! Ahhhh, looks at their beautiful eyes! All of these photos are gorgeous. I can’t get over how cool that tent is. Great post, thanks for sharing! Those eye sure were gorgeous! And yeah, the whole lodge was so nice – I honestly didn’t want to leave! I’m definitely a dog person even though mine is not an enthusiastic runner. And, seeing the northern lights has crept way up on my boomeresque bucket list, so glamping at Holmen would tick a lot of boxes for me. It’s definitely a great spot for both doggie cuddles AND the Northern Lights! So lucky you got to see the lights! I just returned from a trip to the Yukon to view the lights but we didn’t see them at all! The glamping tents look absolutely perfect for viewing. You actually couldn’t see the lights from inside the lavvos – they point in the wrong direction! But you could see them OVER the tents, which I thought actually made for a better photo! I got lucky on this trip to Norway, and actually saw the Lights 4 times! 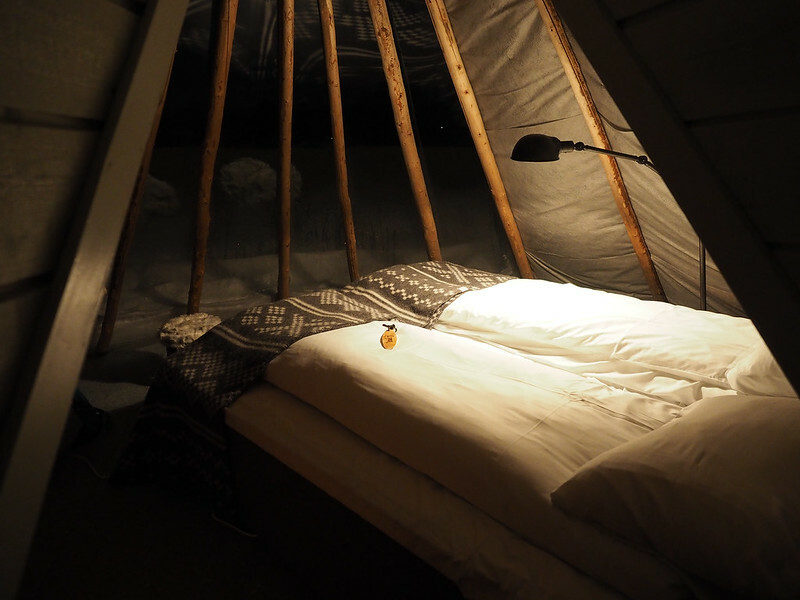 My kind of glamping – the pictures look stunning! Definitely bucket list material. This is definitely on my bucket list! Gorgeous photos! Thanks! It was so fun – probably my favorite thing I did in Alta! So glad you enjoyed yourself in my homeland,the north is the best part of Norway. Will sure take a trip to Alta,next time!! I love Norway so much! This definitely wasn’t my last trip there. OMG I’m in! We were in Iceland last year to try and get a glimpse of the Northern Lights but no luck. 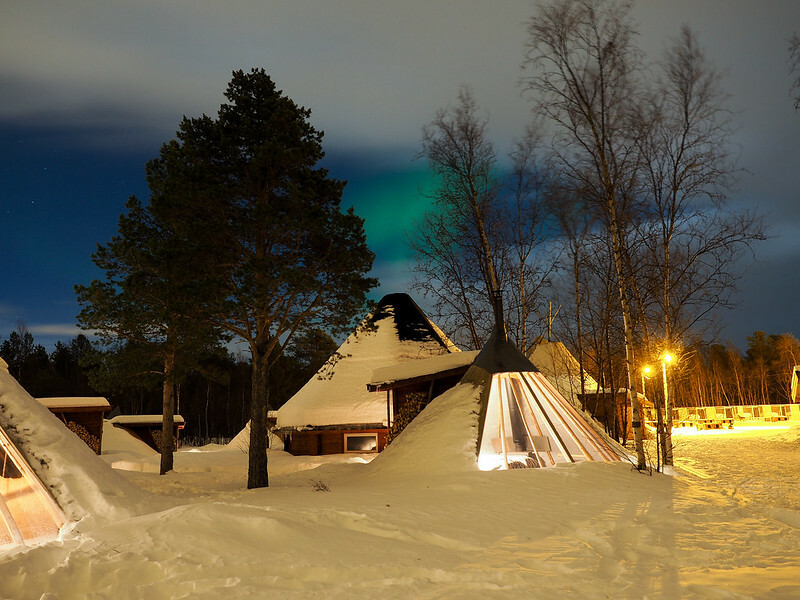 I think staying in one of those huts would definitely increase our chance of catching the lights. The Lights can be really tricky – so many conditions have to be just right! But yes, this is a great place to try to see them! Ah, very cool! Hopefully you enjoyed it! Wow, this looks amazing and is now on my list. How fast do the dogs actually go, like is it very fast? How far away is the bathroom from the tent (in case to get up in the middle of the night!)? Chasing the Northern Lights is my dream bucket holiday. 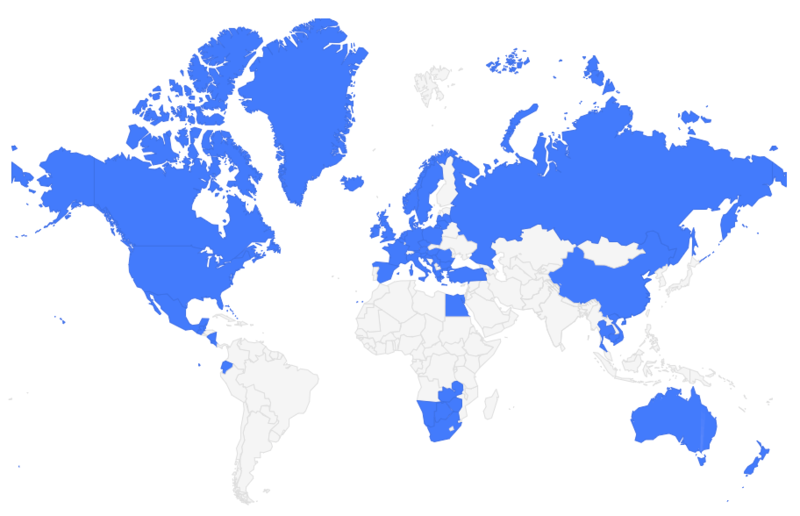 Hoping to get there in the next couple of years – so far away from Australia. The dogs don’t go super fast – maybe about 15 miles per hour on average. The bath house was maybe 100m away from the lavvos – you just had to put back on all your layers to walk through the snow! Norway is high on my bucket list and this looks like a worthy addition to any itinerary! It most definitely is! And really unique, too – there aren’t too many places you can get all these experiences in just one night! Amanda, Your posts have been very helpful… Would you recommend renting a car or using the rail/public transportation in Norway? I am planning a 10-day trip in September and would like to include Oslo, Bergen, Jotunheimen National Park, and Lofoten Islands. Wondering what’s most time and cost efficient. Thank you. Sounds fun! glamping with huskies teo of my most favorite thing in life. Gotta try this! Thanks to the author for sharing your wonderful experience and for inspiring all of us! It definitely was a highlight of the trip for me! Thank you for sharing such a beautiful post with breathtaking photos. I always wanted to visit Norway. I’ve been putting it off for the last 2 years but looking at these huskies have convinced me. I am a dog lover and I’ll do everything I can to make my trip there this year! Norway is incredible, and I don’t think you’ll regret going!